Previously a quiet website, Dreams Group wished to dramatically reposition its B2B Portal in India. They wished to expand their presence in the India, increase the number of members and visitors to their website, and leverage the strength of the Portal. Initiatives related to the Search engine optimization included changes in the corporate identity, development of proprietary branded processes, creation of new marketing strategy and related messages for key publics, and internal education and alignment to ensure day-to-day delivery of the B2B Portal.Because the plan was to overhaul the existing B2b website, Our SEO specialists started with the development of the most appropriate SEO Keyword Strategy for the company, searching for and identifying those search terms most likely to be used by prospective clients wishing to find and evaluate potential building partners. The technical evaluation proved to be a bit more difficult investigation. A review of HTML code and site architecture SEO factors revealed major issues. But as we evaluated third-party referral reports and the search engine results for long-tail keywords, a duplicate content issue was uncovered. We created a subdomain as an directory for those 5000 products and services sharing informative data related to those key phrases, so that website get resulted in search engines for those terms. We optimized meta tags and improved website performance with relevant to speed, and CSS. It took us almost 6 months to accomplish results for this B2b website. It was not easy to work on an B2B website developed in PHP with big graphics on all pages. We carefully optimized images of the website to reduce their file size without changing the quality and appearance. We changed the urls of website to Google spider friendly urls. We tried getting high quality links for this website, by submitting it to relevant directories. This was not enough, we then started with our social media activities to make this website popular and get enough votes for search engines to rate it. Results of the site optimization now place the company’s website and its related pages in some of the top search results for Google for numerous key search terms related to the company’s industry and marketplace. Results from Yahoo were similar. Rankings were as of three months after posting the optimized site. 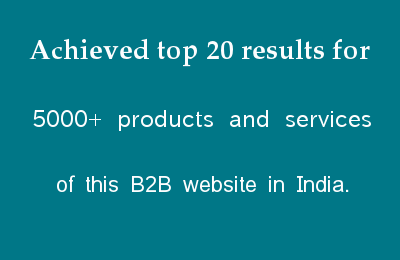 We successfully achieved top 20 results for 5000+ products and services of this B2B website in India.